Oh, and the photo above is of Zoe, me, and a little too much of my leg… sorry about that! KENT: Good morning! I’m Kent Williamson and this is my wife Karen and we are going to share our Encounter with God through the life of our daughter Zoe. KAREN: We love to talk about Zoe! But Zoe is not a short term experience or even a season of life. Just in her being, she represents a change from one path to another, from one destination to a very different one than we had planned. But we can certainly testify to God’s goodness and grace through what was a major life adjustment and transition. Zoe is our sixth child and she was born with Down syndrome. We weren’t actually expecting to have a sixth child. If you’ve seen our family together, you might have noticed a rather large gap between Zoe and the other five. So that part was a surprise—the week of my 40th birthday, I might add. And we didn’t learn about her Down syndrome until she was born, so that was yet another surprise. KENT: I will never forget, looking into her eyes for the very first time, thinking I’ve “seen those eyes before” and then I realize, “Oh my gosh, my little girl has Down syndrome”…. That moment felt like someone had swung a baseball bat as hard as they could square across my chest. I’ve never felt so very alone as in those first few minutes of Zoe’s life when I knew about the Down syndrome, but Karen didn’t know yet. KAREN: And nothing prepares you for that moment. Nothing prepares you for the time when you were expecting one thing in life, and are then handed something completely different. I’m not sure I can describe in words how it feels when that “thing” is handed to you by a stranger, wrapped up in a receiving blanket. It could have been the scene at an ordinary restaurant when I might have said, Oh no, I’m sorry, this is not what I ordered. Please take this back, and bring me what I ordered. But we all know, life doesn’t work that way, does it? KENT: We had five other kids who were anxious to meet their new little sister. So what do you do? For the kids sake, do you just ignore the Down syndrome diagnosis and pretend it doesn’t exist? We’ve never been that kind of family, so instead we sat them all down on the end of the bed in that hospital room at the old Martha Jefferson and I told them, as best I could, about Zoe’s 21st chromosome. What I thought I was doing was explaining that Zoe has Down syndrome. What I didn’t realize at the time was that I was really explaining that our family has Down syndrome. KAREN: I regret to say now that those first days and weeks were for me full of sadness and anguish. And I wish I could say that it was only a short time before things turned brighter in my heart. In reality, it was a couple years before these unexpected circumstances felt kindof normal. And in that time, I did an awful lot of soul-searching, trying to understand my grief, and understand God in the midst of it. I had to ask the hard questions of myself like, Why is this so hard for me? What are my beliefs about what my family should look like, and what are those actually based on? And down deep below the surface, I was discovering a lot of pride and misplaced values. I was seeing in myself a flawed view of myself and the world around me. I was taking pride in things that I had no part in making a reality, and I had been placing merit and value on things that were superficial and temporal. I read a quote recently by Charles Spurgeon that hits right on my guilt. “Be not proud of race, face, place, or grace.” In some rather subtle ways, I had been valuing things like status, intellect, appearance, correct behavior. But now alongside my grief, I had this child who I was falling in love with. I was beginning to embrace a child who wouldn’t be able to meet these expectations. So something in me would need to change in order to make a place for Zoe in my heart. I am here to tell you, God did do a work in my heart. It was incredibly painful in the beginning, and humbling. But somewhere along the way, when your values and standards shift, you find beauty in things that once were not beautiful. And joy in things that once were not joyful. Even in the earliest days after Zoe’s birth, I was filled with an enormous measure of grace for almost everyone I encountered. I was nearly overcome with the realization that we are all given a place in this life, a color, status, genetic makeup, even a faith, that has nothing to do with our own will or determination. All we can do is build on what we’ve been given. That realization invoked in me a care about people I would previously have overlooked. KENT: It didn’t take long for me to bond with Zoe. She makes me smile, laugh. and cry… just like my kids without Down syndrome. Kids with Down syndrome will skin their knees. pinch their fingers, bump their heads. They will also learn to climb stairs one big step at a time, ride their bike with training wheels, and love to jump on trampolines. And Zoe loves to read. As a matter of fact she just finished first grade as one of the top readers in her class. And they will steal your heart and never give it back. KAREN: So I was given this child. She was a gift I didn’t know I needed. She was a gift I didn’t easily receive. But the gift has never been the problem—my own fears, uncertainties, and misplaced values were the problem. It turns out that Zoe has been a blessing beyond our wildest imaginings. There are still hard places, and challenges, and sometimes we grieve about various things. But I think I can honestly say we never grieve over what Zoe is not, or what she is lacking. 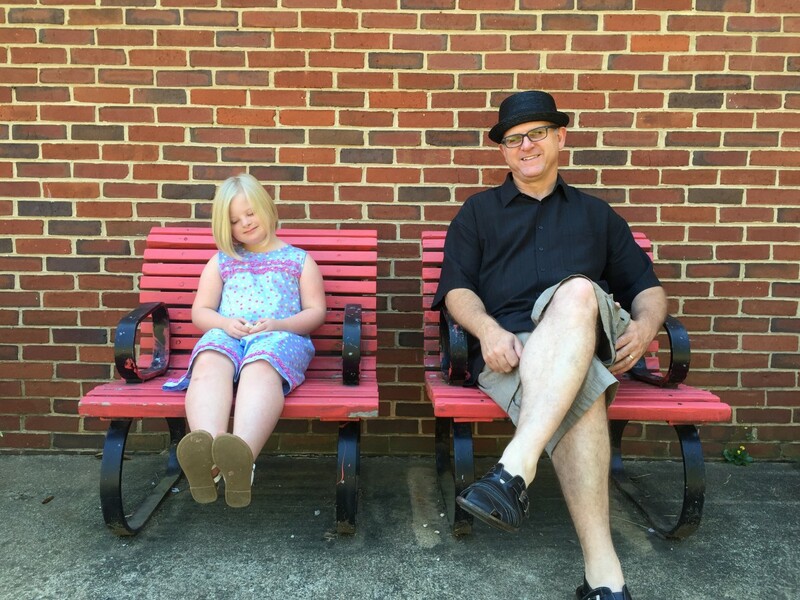 KENT: My little girl doesn’t care that she has Down syndrome. She just wants to be loved like the rest of us. Our family has Down syndrome and that diagnosis is okay with me. I’ve realized over the last 8 years that I am a better person with Down syndrome than I was without. It has made me more compassionate; more accepting of others; more in love with people and all their complex issues. I am a better man with Zoe in my life. God has given me such a wonderful gift—a gift that in my ignorance I would have rejected if I could have. KAREN: So what have I learned, what do I value now? I value laughter, because Zoe is hilarious and constantly makes us laugh. I value music, because every since she first found her voice, the first sound I hear from her room in the morning is her singing. I value innocence and purity, because though I know she has a sinful nature, she really is not naughty or mischievous, she is kind and generous. I value authenticity, because Zoe is completely who she is without pretense or concern for image. I value connectedness in relationship, because these kids, our other five kids, have the most beautiful relationships with Zoe I have ever seen among siblings. KENT: “Zoe” means “life” in Greek—both physical and spiritual. It was the name Karen and I decided on before she was born. And as we see her as the gift of God she is, her name couldn’t be more fitting.